The University of Michigan–Flint (commonly referred to as U of M–Flint) is a public university in Flint, Michigan. It is one of the two University of Michigan satellite campuses (the other is in Dearborn). The thought of establishing a part of the University of Michigan in the city of Flint started in the year 1837 when Sarah Miles wrote a letter to her family stating, "A branch of the Michigan University at Ann Arbor is to be established in Flint at some future day." In May 1944 the Flint Board of Education requested that the University of Michigan open a satellite campus in Flint. In June 1944, Franklin D. Roosevelt signed the G.I. Bill into law. The demand for higher education increased with the return of soldiers after World War II, and was a major factor in the establishment of a branch of the University of Michigan in the city of Flint. During 1947 the Regents of the University of Michigan approved a higher education needs assessment for Flint. Community indicated that they wanted a similar four year liberal arts college similar to Ann Arbor's College of Literature, Science, and the Arts. Later, in February 1956, David M. French was named the first dean of the Flint Senior College of the University of Michigan. Flint College opened on the Flint Community Junior College campus. The college's initial enrollment was 167 enrollees. Degrees were offered in bachelor's degrees in liberal arts and sciences and in the professional fields of education and business administration. Original donors to construction buildings was C.S. Mott and the Sponsors Fund of Flint. The college's first class graduated in 1958. The college became a four-year institution in 1964, adding its first freshman class the next year. In 1970, the North Central Association of Colleges and Secondary Schools granted accreditation to the Flint College of the University of Michigan. The Regents of the University of Michigan approved the name change to The University of Michigan–Flint in 1971, and named William E. Moran as the first Chancellor of the University of Michigan–Flint. Two schools were formed at Flint in 1975, the College of Arts and Sciences, the School of Management. The community and city assisted UM-Flint in acquiring along the Flint River 42 acres. $5 million over five years was pledged towards a new campus in 1972 by the C.S. Mott Foundation. During September 1972, sixteen temporary buildings were erected to ease campus overcrowding, pressuring the Regents to move UM-Flint to its current location along the Flint River. On September 1, 1973, the Regents passed the plans for the first building by Sedgewick-Sellers & Associates, originally planned for a site at Lapeer Road and Court Street. Instead, the first building was moved to a site on the Flint River, the current campus location. The university acquired the Ross House and the Hubbard Building. Its ground breaking ceremony was held on May 9, 1974 at the Wilson Park bandstand. In 1977, construction ended on the Class Room Office Building (CROB), later named David M. French Hall, and the Central Energy Plant. CROB included a library and theatre. In 1979, the original Harrison Street Halo Burger location was vacated to make way for University of Michigan–Flint parking. While, the Harding Mott University Center (UCen) was finished that same year and the Recreation Center in 1982. William S. Murchie Science Building was completed in 1988. In 1991, UM-Flint took over ownership of the Water Street Pavilion as the University Pavilion keeping restaurants there while moving in administrative offices. The library moved to its own building in 1994 with the completion of the Frances Willson Thompson Library. The 25 acre site across the river on the north side was acquired in 1997. Northbank Center was acquired in 1998. In 1989, the School of Health Professions and Studies was formed. While the School of Education and Human Services was formed in 1997. In September 1999, Juan E. Mestas began his tenure as the fifth Chancellor of the University of Michigan–Flint. The William S. White Building was completed on the north side of the Flint River in 2002 for School of Health Professions and Studies and the School of Management. Halo Burger returned to the campus in September 2002 only to be forced out due to on campus housing food regulations in 2008. Ruth Person became chancellor in 2008. The first on campus dorms, First Street Residence Hall, were completed in 2008. The University of Michigan–Flint in 2010 was the fastest-growing public university in the state of Michigan. The School of Management moved to a leased floor of the Riverfront Residence Hall in early 2013 from the White Building at renovation cost of $5.3 million. In 2013, Person's five-year term was up and was extended for a year by UM President Mary Sue Coleman to 2014. In August 2014, Sue Borrego began as Chancellor. On October 15, 2015, University Board of Regents approved the purchase of the 160,000-square-foot, 10-story north tower building of the Citizens Banking Buildings from FirstMerit Bank for $6 million expected to close in March 2016. In mid-December 2015, the Uptown Reinvestment Corporation donated the Riverfront Residence Hall and Banquet Center to the university with the Charles Stewart Mott Foundation forgiving the remaining redevelopment loan for the center. The Harrison Street Annex, at Kearsley and Harrison Streets in the Harrison Street parking structure, was being remodeled to be the university's dance studio. On October 20, 2016, the Regents formed the School of Nursing from the Department of Nursing in the School of Health Professions and Studies. In November 2004, the Board of Regents of the University of Michigan approved the request of the Flint Campus to explore the feasibility of student housing. After several assessments, studies, and surveys showing the probable progression of growth of the campus, student housing was approved. On July 16, 2007, the first-ever student dormitory, the First Street Residence Hall, opened for students. In December 2015, Uptown Reinvestment Corporation donated the Riverfront Residence Hall, a privately owned high-rise building that houses both U of M and Baker College students, to the university. The 16-story Residence Hall can house up to 500 students. The school owns WFUM (91.1 FM), a public radio station affiliated with the Michigan Radio network. The Michigan Times is a student-run campus newspaper. In 2008, the Michigan Press Association's "Better College Newspaper Contest" awarded The Michigan Times with nine awards in a statewide competition. This achievement was surpassed in 2009 by winning 23 awards. The newspaper is printed weekly and is available free-of-cost on campus, at other area colleges, in the surrounding downtown area and elsewhere in the Greater Flint area. The University of Michigan–Flint Student Government (UMFLINT SG) represents the students and manages student funds on the campus. Student Government is a member of the statewide Association of Michigan Universities. UM–Flint does not offer varsity intercollegiate athletics, but there are a number of club sport teams and intramural sports leagues available to students. Teams have competed as Wolverines, while an unofficial student vote in 2009 selected The Victors to avoid confusion with the main campus.Students, staff and alumni are also able to buy tickets to the flagship campus' sporting events at a discounted price. In 2013, the men's hockey team earned a spot in the ACHA Division III National Tournament for the first time, eventually advancing to the National Championship Game against fellow Michigan Collegiate Hockey Conference foe Adrian College. In 2015, the women's hockey team went 18-0 in conference play. The University of Michigan–Flint is rated as one of the best master's-level public universities in the Midwest by US News and World Report. The Princeton Review has included UM–Flint in the "Best in the Midwest" category in their publication 2014 Best Colleges: Region by Region. The Part-Time MBA Program is ranked 41st in the United States (overall) and 9th in the Midwest (by region). The Princeton Review has also included UM–Flint's School of Management in their The Best 301 Business Schools: 2010 Edition. ^ "University of Michigan—Flint – Best College – Education – US News". 2016. Retrieved September 12, 2017. ^ Serow, Mel (September 19, 2012). "Enrollment climbing at U-M, Kettering college campuses in downtown Flint". University of Michigan Flint. Retrieved September 19, 2012. ^ UM-Flint Brand Toolkit – University of Michigan-Flint (PDF). Archived from the original (PDF) on July 9, 2017. Retrieved November 10, 2017. ^ a b Mostafavi, Beata (September 22, 2008). "Sports talk at University of Michigan–Flint sparks more mascot consideration". Flint Journal. Flint, Michigan: Booth Newspapers. Archived from the original on May 17, 2009. Retrieved October 29, 2008. ^ a b Shoup, Allison (April 25, 2008). "'Victors' not yet a sure thing". The Michigan Times. Archived from the original on August 12, 2014. Retrieved April 9, 2012. ^ Club & Organizations. umflint.edu. ^ a b c d e f g Weller, Krysten (September 21, 2006). "University of Michigan-Flint celebrates its 50th anniversary". The Grand Blanc View. Archived from the original on March 4, 2016. Retrieved December 10, 2014. ^ a b UM-Flint. "Timeline and History". Archived from the original on February 25, 2009. Retrieved December 7, 2010. ^ a b c d e f g Thomas Gnagey, Laurel (October 2, 2006). "Flint campus is 50 years young". University Record. Retrieved September 5, 2017. ^ a b c d Schuch, Sarah. "From dirt to dorms: UM-Flint still growing 40 years after historic groundbreaking". The Flint Journal. Mlive Media Group. Retrieved December 10, 2014. ^ a b c Emery, Amanda (October 20, 2016). "University of Michigan-Flint campus to add nursing school". Flint Journal. Mlive Media Group. Retrieved October 21, 2016. ^ a b Christy Ryan (April 21, 2008). "Halo Burger reluctant to leave in fall". Michigan Times. Flint, Michigan: University of Michigan-Flint. Archived from the original (shtml) on April 2, 2015. Retrieved June 2, 2008. ^ a b c d e f Schuch, Sarah (October 16, 2015). "What to know about UM-Flint buying portion of historic Flint bank building". Flint Journal. Mlive Media Group. Retrieved October 19, 2015. ^ a b Mostafavi, Beata (July 22, 2011). "University of Michigan-Flint business students to trade stocks in mini Wall Street center in Riverfront Residence Hall". Flint Journal. MLive Media Group. Retrieved October 19, 2015. ^ a b Thorne, Blake Thorne (January 23, 2013). "University of Michigan-Flint Chancellor Ruth Person says she will depart in 2014". Flint Journal. Mlive Media Group. ^ "Flint Campus of the University of Michigan keeps rank as state's fastest growing university". M Live. April 15, 2010. Retrieved October 20, 2010. ^ Woodhouse, Kellie (April 17, 2014). "University of Michigan appoints Susan Borrego as Flint chancellor". MLive.com. Retrieved January 11, 2015. ^ Schuch, Sarah (October 15, 2015). "UM-Flint buys part of historic downtown bank building". Flint Journal. Mlive Media Group. Retrieved October 20, 2015. ^ Jackman, Caresse. "Uptown Reinvestment Corporation donates Riverfront Residence Hall Banquet Center to UM-Flint". ABC12.com. WJRT. Archived from the original on June 4, 2016. Retrieved December 30, 2015. ^ Sabella, Anthony (December 29, 2015). "2015 a good year for Downtown Flint". ABC12.com. WJRT. Retrieved December 30, 2015. 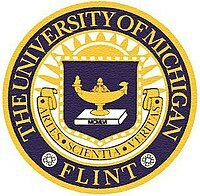 ^ "U of Michigan creates School of Nursing at Flint campus". ABC12. WJRT. October 21, 2016. Retrieved October 21, 2016. ^ Adams, Dominic. "U-M Flint aims to grow international enrollment with Riverfront donation". MLive.com. MLive Media Group. Retrieved December 19, 2015. ^ "Team Directory | University of Michigan-Flint". www.umflint.edu. Retrieved July 3, 2018. ^ "US News and World Report: Best Colleges 2011". US News and World Report. September 10, 2008. Retrieved September 17, 2010. ^ UM-Flint. "Best in the Midwest". Retrieved August 5, 2010. ^ Business Week. "The Top ranked part-time MBA Program". Archived from the original on January 9, 2010. Retrieved November 10, 2009. ^ UM-Flint. "The 2010 Edition: The Best 301 Business Schools". Retrieved October 6, 2009. ^ NCAHLC. "HLC Accreditation". Retrieved December 22, 2008. ^ AACSB. "AACSB Accreditation". Retrieved December 22, 2008. ^ APTA. "APTA Accreditation". Archived from the original on November 30, 2008. Retrieved December 22, 2008. ^ AANA. "AANA Accreditation". Archived from the original on May 17, 2009. Retrieved December 22, 2008. ^ CSWE. "CSWE Accreditation". Retrieved December 22, 2008. ^ JRCERT. "JRCERT Accreditation". Archived from the original on December 25, 2008. Retrieved December 22, 2008. ^ NASM. "NASM Accreditation". Archived from the original on May 16, 2009. Retrieved December 22, 2008. ^ "Donald W. Riegle, Jr Archives". Biography. University of Michigan-Flint. Retrieved October 12, 2015. ^ "Michael Moore". Biography. New York Times. Retrieved October 27, 2015. ^ "Marietta S. Robinson". Biography. U.S. Consumer Product Safety Commission. Retrieved October 12, 2015.